Our high quality tapestries are woven and hand finished in Italy. They have an exquisite combination of colorful weaves with brilliant gold and silver metallized thread highlights. 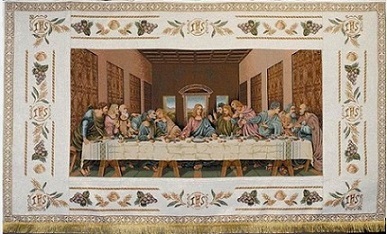 We have over 300 standard images available in different sizes (not all are on web sites, view all on www.ecumenicus.com). 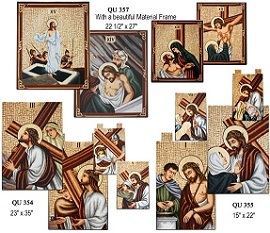 In this category we have prices ranging from $5.00 to $28.00, and any of these images can be used to create a woven stole or chasuble. We are always adding new images, look for them at the beginning of each category. Overlay Stoles by Ecumenicus are richly woven using the finest materials and crafted to compliment vestments. They have an inspiring combination of artistic appliqué creating brilliant color and image detail with gold and silver metallized thread highlights. There are over 200 standard images to choose from (see our Tapestry Category). 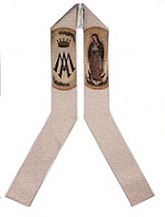 Matching Deacon Stoles are also available. We can personalized them in size and can custom designed any to match your congregational vestments, using your symbols, icons and color schemes. Call 609 937-7799 for more information. Deacon Stoles created in Italy by Ecumenicus are richly woven using the finest materials and crafted to compliment vestments. They have an inspiring combination of artistic appliqué highlighted with gold and silver metallized thread. 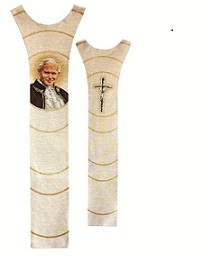 Stoles can also be personalized in size and can be custom designed to match your congregational vestments, using your symbols, icons and color schemes. As Low as $98.00 and AVG Price $350.00 Elegant chasubles from Leffe, Italy are available in all liturgical colors and can be manufactured by special order specifications. The bands and over 200 standard images are richly woven using the finest materials and crafted to compliment vestments. They have an inspiring combination of artistic appliqué plain or with gold, silver, metalized and cloth threads. These are all Hand finished in Italy's Taylor's shop. SQUARE COLLARS or NO COLLARS are available on request and matching Dalmatics are also available. Scapulars by Ecumenicus are richly woven using the finest materials and crafted to compliment vestments. They have an inspiring combination of artistic appliqué plain or with gold, silver cloth and thread. 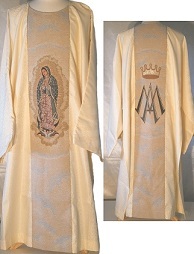 Mix and match these to our beautiful selection of plain chasubles. Scapulars can also be personalized in size and can be custom designed to match your congregational vestments, using your symbols, icons and color schemes. Woven and hand finished in Italy. Processional Banners have an exquisite combination of colorful appliqué with gold cloth thread. They are fully lined and are finished with a gold fringe along the sides and bottom. All banners have hanging tabs and come in a standard size of 30" X 50" + 3" Material: 40% Cotton, 40% Polyester, 10% Metalized Polyester, 10% other fiber. Ecumenicus can also personalize a custom design and manufacture banners to your specification. Ecumenicus banners are woven on a loom with an exquisite combination of colorful cloth, silver and gold threads made up of Material:40% Cotton, 40% Polyester, 10% Metalized Polyester, 10% other fiber. A back lining of 100% polyester is added to ensure stability for a beautiful showing. Endless customizing and personalizing possibility! Standard sizes are 22" x 46" for $180.00 and 44" x 90", starting at $730.00. Length sizes can various depending on top 2-3" loops and image. 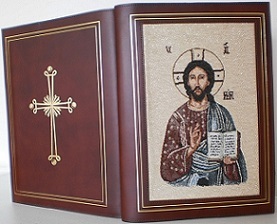 Woven and hand finished in Italy.The Altar covers and frontals come in a standard size of 45” x 75” however; Ecumenicus can also custom design and manufacture Altar Covers and frontals to your specification. Material 40% Cotton, 40% Polyester, 10% Metalized Polyester, 10% other fiber. Leather Book Covers with woven tapestry images are available in any size. Not only can you customize the size you can select from over 250 standard woven images. Colors available: white, black, green, red, and brown. 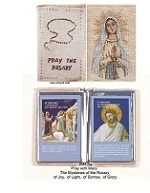 $15.00 These handy size Rosary books are 3 ½” x 6” and come with a rosary ring. The cover is woven and hand finished in Leffe, (Bergamo) Italy. Pray with Mary the Mysteries of the Rosary. The inside cover pockets can also hold all your prayer cards. 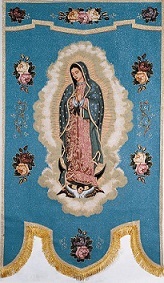 High Quality Tapestry Images are Woven and hand finished to Dalmatic's. Made in Leffe' Italy. Stations Of The Cross have an exquisite combination of colorful appliqué with beautiful cloth and metallized gold threads. 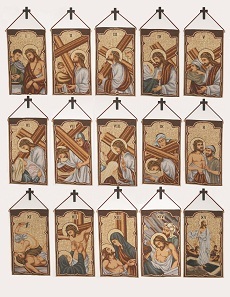 Stations Of The Cross have an exquisite combination of colorful appliqué with beautiful cloth and metallized gold threads. Order top with two loops or a rod pocket. Available with a heavy back lining.